Angles may be trisected via a neusis construction using tools beyond an unmarked straightedge and a compass. The example shows trisection of any angle θ>3π/4 by a ruler with length equal to the radius of the circle, giving trisected angle φ=θ/3. Angle trisection is a classical problem of compass and straightedge constructions of ancient Greek mathematics. It concerns construction of an angle equal to one third of a given arbitrary angle, using only two tools: an unmarked straightedge and a compass. The problem as stated is impossible to solve for arbitrary angles, as proved by Pierre Wantzel in 1837. However, although there is no way to trisect an angle in general with just a compass and a straightedge, some special angles can be trisected. For example, it is relatively straightforward to trisect a right angle (that is, to construct an angle of measure 30 degrees). It is possible to trisect an arbitrary angle by using tools other than straightedge and compass. For example, neusis construction, also known to ancient Greeks, involves simultaneous sliding and rotation of a marked straightedge, which cannot be achieved with the original tools. Other techniques were developed by mathematicians over the centuries. Because it is defined in simple terms, but complex to prove unsolvable, the problem of angle trisection is a frequent subject of pseudomathematical attempts at solution by naive enthusiasts. These "solutions" often involve mistaken interpretations of the rules, or are simply incorrect. Bisection of arbitrary angles has long been solved. Using only an unmarked straightedge and a compass, Greek mathematicians found means to divide a line into an arbitrary set of equal segments, to draw parallel lines, to bisect angles, to construct many polygons, and to construct squares of equal or twice the area of a given polygon. Pierre Wantzel published a proof of the impossibility of classically trisecting an arbitrary angle in 1837. Wantzel's proof, restated in modern terminology, uses the abstract algebra of field extensions, a topic now typically combined with Galois theory. However Wantzel published these results earlier than Galois (whose work was published in 1846) and did not use the connection between field extensions and groups that is the subject of Galois theory itself. The problem of constructing an angle of a given measure θ is equivalent to constructing two segments such that the ratio of their length is cos θ. From a solution to one of these two problems, one may pass to a solution of the other by a compass and straightedge construction. The triple-angle formula gives an expression relating the cosines of the original angle and its trisection: cos θ = 4 cos3 θ/3 − 3 cos θ/3. It follows that, given a segment that is defined to have unit length, the problem of angle trisection is equivalent to constructing a segment whose length is the root of a cubic polynomial. This equivalence reduces the original geometric problem to a purely algebraic problem. Every rational number is constructible. Every irrational number that is constructible in a single step from some given numbers is a root of a polynomial of degree 2 with coefficients in the field generated by these numbers. Therefore, any number that is constructible by a sequence of steps is a root of a minimal polynomial whose degree is a power of two. Note also that π/3 radians (60 degrees, written 60°) is constructible. The argument below shows that it is impossible to construct a 20° angle. This implies that a 60° angle cannot be trisected, and thus that an arbitrary angle cannot be trisected. Denote the set of rational numbers by Q. If 60° could be trisected, the degree of a minimal polynomial of cos 20° over Q would be a power of two. Now let x = cos 20°. Note that cos 60° = cos π/3 = 1/2. Then by the triple-angle formula, cos π/3 = 4x3 − 3x and so 4x3 − 3x = 1/2. Thus 8x3 − 6x − 1 = 0. Define p(t) to be the polynomial p(t) = 8t3 − 6t − 1. Since x = cos 20° is a root of p(t), the minimal polynomial for cos 20° is a factor of p(t). Because p(t) has degree 3, if it is reducible over by Q then it has a rational root. By the rational root theorem, this root must be ±1, ±1/2, ±1/4 or ±1/8, but none of these is a root. Therefore, p(t) is irreducible over by Q, and the minimal polynomial for cos 20° is of degree 3. So an angle of measure 60° cannot be trisected. However, some angles can be trisected. For example, for any constructible angle θ, an angle of measure 3θ can be trivially trisected by ignoring the given angle and directly constructing an angle of measure θ. There are angles that are not constructible but are trisectible (despite the one-third angle itself being non-constructible). For example, 3π/7 is such an angle: five angles of measure 3π/7 combine to make an angle of measure 15π/7, which is a full circle plus the desired π/7. For a positive integer N, an angle of measure 2π/N is trisectible if and only if 3 does not divide N. In contrast, 2π/N is constructible if and only if N is a power of 2 or the product of a power of 2 with the product of one or more distinct Fermat primes. Again, denote the set of rational numbers by Q.
Theorem: An angle of measure θ may be trisected if and only if q(t) = 4t3 − 3t − cos(θ) is reducible over the field extension Q(cos(θ)). The proof is a relatively straightforward generalization of the proof given above that a 60° angle is not trisectible. The general problem of angle trisection is solvable by using additional tools, and thus going outside of the original Greek framework of compass and straightedge. Many incorrect methods of trisecting the general angle have been proposed. Some of these methods provide reasonable approximations; others (some of which are mentioned below) involve tools not permitted in the classical problem. The mathematician Underwood Dudley has detailed some of these failed attempts in his book The Trisectors. Trisection can be approximated by repetition of the compass and straightedge method for bisecting an angle. The geometric series 1/3 = 1/4 + 1/16 + 1/64 + 1/256 + ⋯ or 1/3 = 1/2 − 1/4 + 1/8 − 1/16 + ⋯ can be used as a basis for the bisections. An approximation to any degree of accuracy can be obtained in a finite number of steps. Trisection, like many constructions impossible by ruler and compass, can easily be accomplished by the more powerful operations of paper folding, or origami. Huzita's axioms (types of folding operations) can construct cubic extensions (cube roots) of given lengths, whereas ruler-and-compass can construct only quadratic extensions (square roots). There are a number of simple linkages which can be used to make an instrument to trisect angles including Kempe's Trisector and Sylvester's Link Fan or Isoklinostat. Trisection of the angle by means of the Rechtwinkelhaken according to Ludwig Bieberbach, with continuation of the construction, animation 1 min 35 s, of which break at the end 30 s.
"As is known ... every cubic construction can be traced back to the trisection of the angle and to the multiplication of the cube, that is, the extraction of the third root. I need only to show how these two classical tasks can be solved by means of the right angle hook." The following description of the adjacent construction (animation) contains their continuation up to the complete angle trisection. There are certain curves called trisectrices which, if drawn on the plane using other methods, can be used to trisect arbitrary angles. The known Trisectrix of Colin Maclaurin from the year 1742 is used. Another means to trisect an arbitrary angle by a "small" step outside the Greek framework is via a ruler with two marks a set distance apart. The next construction is originally due to Archimedes, called a Neusis construction, i.e., that uses tools other than an un-marked straightedge. The diagrams we use show this construction for an acute angle, but it indeed works for any angle up to 180 degrees. Any two equal sides of an isosceles triangle will meet the third in the same angle. Let l be the horizontal line in the adjacent diagram. Angle a (left of point B) is the subject of trisection. First, a point A is drawn at an angle's ray, one unit apart from B. A circle of radius AB is drawn. Then, the markedness of the ruler comes into play: one mark of the ruler is placed at A and the other at B. While keeping the ruler (but not the mark) touching A, the ruler is slid and rotated until one mark is on the circle and the other is on the line l. The mark on the circle is labeled C and the mark on the line is labeled D. This ensures that CD = AB. A radius BC is drawn to make it obvious that line segments AB, BC, and CD all have equal length. Now, triangles ABC and BCD are isosceles, thus (by Fact 3 above) each has two equal angles. Conclusion: angle b = a/3. Clearing, a − 3b = 0, or a = 3b, and the theorem is proved. Again, this construction stepped outside the framework of allowed constructions by using a marked straightedge. Thomas Hutcheson published an article in the Mathematics Teacher that used a string instead of a compass and straight edge. A string can be used as either a straight edge (by stretching it) or a compass (by fixing one point and identifying another), but can also wrap around a cylinder, the key to Hutcheson's solution. Hutcheson constructed a cylinder from the angle to be trisected by drawing an arc across the angle, completing it as a circle, and constructing from that circle a cylinder on which a, say, equilateral triangle was inscribed (a 360-degree angle divided in three). This was then "mapped" onto the angle to be trisected, with a simple proof of similar triangles. A tomahawk trisecting an angle. The handle forms one trisector and the blue line shown forms the other. A "tomahawk" is a geometric shape consisting of a semicircle and two orthogonal line segments, such that the length of the shorter segment is equal to the circle radius. Trisection is executed by leaning the end of the tomahawk's shorter segment on one ray, the circle's edge on the other, so that the "handle" (longer segment) crosses the angle's vertex; the trisection line runs between the vertex and the center of the semicircle. Note that while a tomahawk is constructible with compass and straightedge, it is not generally possible to construct a tomahawk in any desired position. Thus, the above construction does not contradict the nontrisectibility of angles with ruler and compass alone. The tomahawk produces the same geometric effect as the paper-folding method: the distance between circle center and the tip of the shorter segment is twice the distance of the radius, which is guaranteed to contact the angle. It is also equivalent to the use of an architects L-Ruler (Carpenter's Square). 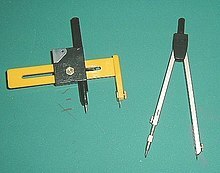 An angle can be trisected with a device that is essentially a four-pronged version of a compass, with linkages between the prongs designed to keep the three angles between adjacent prongs equal. For any nonzero integer N, an angle of measure ​2π⁄N radians can be divided into n equal parts with straightedge and compass if and only if n is either a power of 2 or is a power of 2 multiplied by the product of one or more distinct Fermat primes, none of which divides N. In the case of trisection (n = 3, which is a Fermat prime), this condition becomes the above-mentioned requirement that N not be divisible by 3. ^ Wantzel, P M L (1837). "Recherches sur les moyens de reconnaître si un problème de Géométrie peut se résoudre avec la règle et le compas" (PDF). Journal de Mathématiques Pures et Appliquées. 1. 2: 366–372. Retrieved 3 March 2014. ^ For the historical basis of Wantzel's proof in the earlier work of Ruffini and Abel, and its timing vis-a-vis Galois, see Smorynski, Craig (2007), History of Mathematics: A Supplement, Springer, p. 130, ISBN 9780387754802 . ^ MacHale, Desmond. "Constructing integer angles", Mathematical Gazette 66, June 1982, 144–145. ^ a b McLean, K. Robin, "Trisecting angles with ruler and compasses", Mathematical Gazette 92, July 2008, 320–323. See also Feedback on this article in vol. 93, March 2009, p. 156. ^ Stewart, Ian (1989). Galois Theory. Chapman and Hall Mathematics. pp. g. 58. ISBN 978-0-412-34550-0. ^ Jim Loy (2003) . "Trisection of an Angle". Archived from the original on February 25, 2012. Retrieved 30 March 2012. ^ Yates, Robert C (1942). The Trisection Problem (PDF). The National Council of Teachers of Mathematics. pp. 39–42. ^ Ludwig Bieberbach (1932) Zur Lehre von den kubischen Konstruktionen, Journal für die reine und angewandte Mathematik, H. Hasse und L. Schlesinger, Band 167 Berlin, p. 142–146 online-copie (GDZ). Retrieved on June 2, 2017. ^ Dörte Haftendorn: "Kurven erkunden und verstehen" (German) Kapitel 3.3: S. 62, ISBN 9783658147488, Spektrum, Akademischer Verlag, Springer, 2016, "Trisektrix Konstruktion" (German). Retrieved on January 12, 2017. ^ Hutcheson, Thomas W. (May 2001). "Dividing Any Angle into Any Number of Equal Parts". Mathematics Teacher. 94 (5): 400–405. ^ Isaac, Rufus, "Two mathematical papers without words", Mathematics Magazine 48, 1975, p. 198. Reprinted in Mathematics Magazine 78, April 2005, p. 111. ^ a b c Gleason, Andrew Mattei (March 1988). "Angle trisection, the heptagon, and the triskaidecagon" (PDF). The American Mathematical Monthly. 95 (3): 185–194. doi:10.2307/2323624. JSTOR 2323624. Archived from the original (PDF) on November 5, 2014. Courant, Richard, Herbert Robbins, Ian Stewart, What is mathematics? : an elementary approach to ideas and methods, Oxford University Press US, 1996. ISBN 978-0-19-510519-3.